Mosquitoes are certainly one of the most annoying creatures that mankind has to deal with. However, this insect is far from being merely a pesky bug that can spoil outdoor activities: Mosquitoes can pick up viruses when they feed and transmit dangerous diseases to both humans and animals when they feed again. The world over, mosquito-borne diseases are responsible for one million human deaths annually. According to the Maine Department of Conservation, there are around 40 species of mosquitoes in Maine and about half of those species can cause problems for humans. Eastern Equine Encephalitis, West Nile Virus and Dog Heartworm, (Dirofilaria immitis), are a few of the diseases that are spread by the bite of a mosquito. Of course, it would be impossible to completely isolate your family and pets from exposure to insects, but there are plenty of things you can do around your own home for safe and effective mosquito control. Since mosquitoes need water to lay their eggs, you should inspect your home and surrounding area for situations where water remains after it rains. Both the male and female mosquito feed on plant nectars, but the female is the sole culprit for those itchy bites. When female mosquitoes get a blood meal, they receive a shot of protein which enables them to produce and lay eggs. It only takes about 48 hours for larvae to hatch, so you need to be vigilant to prevent having a mosquito problem. Some mosquito species have limited flight ranges and prefer to feed close to breeding sites. Search your yard for shallow depressions that have damp soil that never quite dries out. If you can, provide drainage in those areas because they will be flooded with water after precipitation and create ideal mosquito breeding conditions. Keep your lawn mowed short and maintain shrubs and flowerbeds around your home’s foundation to allow for good air circulation. Have leaves and yard debris hauled away. If you live in a wooded area, a close-cropped lawn can function as an effective buffer zone between you and hungry woodland mosquitoes. It’s unfortunate, but just a few unsolved problem areas on your property could contribute to an unpleasant and potentially dangerous mosquito infestation. In addition to maintaining your lawn and grounds with mosquito pest control in mind, you should inspect your gutters and downspouts for proper function. Improperly installed or clogged gutters can allow water to remain for days. Change outdoor pet water bowls, bird baths and wading pools frequently. Garbage bins and recycling containers should be covered tightly to keep rain water out. Store watering cans empty and check that the saucers under outdoor potted plants are dry. (Be wary of those convenient self-watering flower pots, as they are intentionally designed to allow water to remain in them for up to a week!) Keep swimming pools and hot tubs clean and chlorinated. Since mosquitoes are attracted by the light from inside your home, door and window screens should fit tightly and without gaps to prevent them from entering. Install yellow light bulbs in outdoor fixtures as they’re not attracted to that color as they are with regular incandescent bulbs. The mosquitoes in Maine are mostly active from dusk until dawn and on overcast days. Heat-seeking creatures, mosquitoes are also attracted to mammals’ exhaled carbon dioxide, the scent of perspiration and even fragrances used in colognes, shampoos and fabric softeners. Wear clothing that blends in with the background to avoid the visual contrast that assists mosquitoes in locating you. Long pants and long sleeves are effective protection after dark and you can apply insect repellant to camouflage your scent. Use one of the excellent plant-based repellants available or judiciously apply a product containing DEET (N,N-diethyl-meta-toluamide). DEET is proven to repel mosquitoes, chiggers, biting flies and ticks, however, some people are sensitive to DEET and it’s best to test yourself before applying a generous dose directly on your skin. It’s possible to get good repellant results if you apply a product with DEET only on clothing, hats and shoes. If your best efforts to significantly reduce the number of mosquitoes aren’t as successful as you would like, it is time to get professional mosquito control advice. Resist the impulse to treat your lawn with products you find at the nearest big box store’s gardening department. Pesticide application is complicated at best and potentially hazardous at worst. Indeed, Maine requires a permit to treat standing water with larvicide, according to the Maine Department of Environmental Protection. At this point, the logical solution to your mosquito problem is to call a licensed pesticide applicator such as Lucas Tree Experts who will ensure that chemicals are applied according to industry safety and health standards. Our team is trained to assess your situation and will suggest an effective treatment program that is safe for you, your family, your pets and the environment. 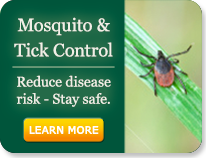 For more information about mosquito control, talk with a Lucas Tree Expert now and find out how Lucas’ Residential Services can help you.